Hi everyone! I'm back, at last. I'm sure many of you know about my recent camera drama, which unfortunately has held off videos for me for the last while, along with blog posts for the last few days. Everything's a-ok now though, so things will get back to normal in no time! I was contacted at the end of last year, to review this beautiful necklace from Old English Hearts on Etsy. The company is based in Manchester; they create beautiful and alternative handmade jewellery. I was asked to choose an item that tickled my fancy, and of course this Skeleton Cameo necklace* jumped out at me straight away! It's unique, Victorian and gothic - I adore it. It's really comfortable to wear, the chain doesn't rub on the skin and it's really light. I always find that buying jewellery on websites like Etsy for yourself, or other people, is always that little more special. Finding a one-off handmade or vintage item is more heartfelt and interesting than picking something up from Topshop! 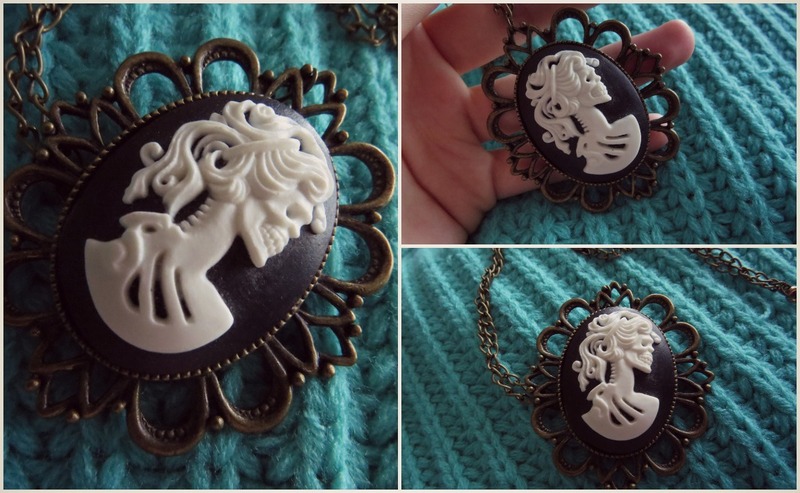 There's currently only one of these Skeleton Cameo necklaces available right now, and it's only €7.32 on sale. It's such a bargain for how well-made and unique the piece is. Of course, the shop is selling a bunch of other handmade pieces such as rings and earrings. It's an ideal online store for anyone who loves anything of the macabre nature, like me! (This skeleton hands necklace is another personal favourite of mine.) Happy Shopping! Visit Old English Hearts on Etsy here.